As your former legislative representatives in Sacramento, we want the community to know how appalled we are by the pending closures of three skilled nursing facilities in Humboldt County. Rockport Management, which manages the five skilled nursing facilities owned by Brius Healthcare Services in Humboldt County, is planning to simultaneously close three facilities in Eureka by March of next year. The closures would reduce the number of beds by 258, or 60 percent. But most devastating, it would have the catastrophic effect of moving hundreds of elderly, poor and vulnerable individuals out of the county to other facilities at this time unknown. And, at this point, there is no guarantee other facilities would be willing or able to receive our local residents. This is simply intolerable. We have been working to try to put a temporary halt to something we believe would have drastic and traumatic consequences for these individuals and their families in order to identify a long-term plan of facility ownership and management that would meet the critical needs of individuals requiring skilled nursing care in Humboldt County, both now and in the future. There have been a number of stakeholder meetings in the district, and formal requests have been made to the California Department of Public Health to reject Rockport's closure and relocation plan to give more time to develop contingency plans to ensure patient safety. The California Office of the State Long-Term Care Ombudsman made written requests to the California Department of Public Health to petition the superior court for an order appointing a receiver to temporarily operate the facilities. That request was denied. Partnership Health Plan, the nonprofit public healthcare organization that contracts with the state to administer Medi-Cal benefits for the residents in these facilities, offered to purchase the three facilities out of concern for their members who would be displaced and to protect the future availability of these services locally. However, Brius' owner, Shlomo Rechnitz told Partnership it would have to purchase all five facilities or none in order to avoid competition. Rechnitz's asking price was $32.6 million. Due to it being an all-or-nothing proposal, Partnership said no. What we believe is required in the short-term is time — time to ensure patients stability by having the Department of Health and Human Services/Department of Public Health stop the transfers so that we can develop a unified plan agreed on by all concerned parties. Creating that critical time may require legal action, which is now being discussed. In the long-term, we must develop a plan to transition ownership and management of Humboldt County's five skilled nursing facilities to new operators. The entire local health system must be involved with this effort, including hospitals and the medical community. If three skilled nursing facilities close, hospital beds will fill up with patients requiring extensive care and rehabilitation, patients whom hospitals would normally discharge to the facilities slated for closure. This will leave other community members needing emergency hospital care with either a long wait in the emergency room or, in the worst case, being sent out of the county for treatment at potentially catastrophic costs, both human and financial. That is our focus now. 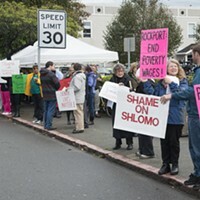 Clearly, though, this is a dire situation that will negatively impact the entire community and potentially every household: hundreds of healthcare workers will be jobless; state and federal dollars that flow into the county will be lost; folks, regardless of age, requiring emergency hospitalization may not be able to be admitted due to a lack of beds. All of this is because of the inexcusable, unnecessary transfer of hundreds of poor, vulnerable senior citizens out of their home, outside of Humboldt County. Specifically, though, it is due to Mr. Shlomo Rechnitz, owner of Brius Healthcare Service, who cries of his loss of Medi-Cal income during this last year because of staffing shortages. Yet, reports say he personally takes in $3 billion in income per year. Go figure. Patty Berg represented the North Coast in the state Assembly from 2002 through 2008 and is the founding director of the Area 1 Agency on Aging. Wesley Chesbro represented the North Coast in both the state Senate and Assembly from 1998 through 2014. For more on this issue, read this week's cover story here.